With the latest developments in passenger and freight transportation firmly in its sight, Uniroyal presents two new tyres for combined regional and long-distance use. The new FH 40 steer axle tyre and the new DH 40 drive axle tyre provide high mileage, improved handling, and optimum traction even on wet roads. Both of these quality tyres come in size 315/80 R22.5 and are suitable for trucks and buses. 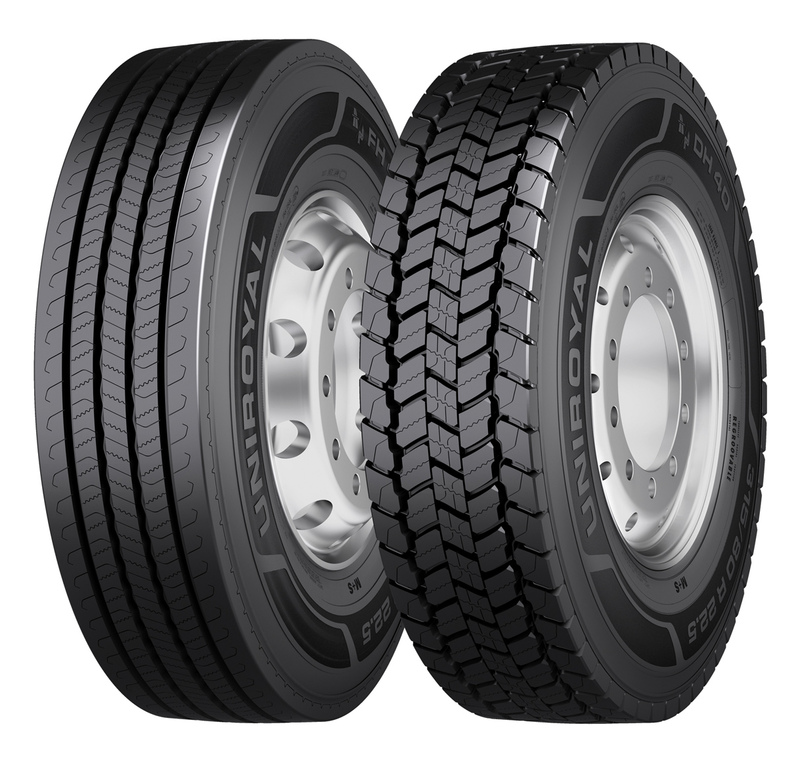 Uniroyal presents two new tires for combined regional and long-distance use. Trucks are increasingly dominating freight transportation on European roads and are the vehicle of choice to transport food and consumer goods quickly and directly, both within urban areas and across national borders. Uniroyal has designed its new line of products to complement these combined applications of regional distribution and long-haul journeys. The FH 40 steer axle tyre and the DH 40 drive axle tyre, size 315/80 R 22.5, both offer excellent mileage and reliable handling. Following in the tradition of the Uniroyal brand, these tyres can be reliably used on buses and trucks and are particularly effective on wet roads. The newly developed tread design of the FH 40 steer axle tyre improves wet grip performance and qualifies it for the "B" rating for EU tyre labels. The special sipe technology used in the tread design optimises water expulsion and ensures safe handling even in rainy conditions. The tyre contour of the FH 40 is optimised for even wear and low rolling resistance, and its new tread compound provides high mileage. The FH 40 features the M+S label. The tread design of the DH 40 drive axle tyre was specially designed for high traction and the tyre can cope well with both wet and snow-covered roads. The basis for all tyres in the new Uniroyal product line is a retreadable carcass. The bead of the carcass on both the FH 40 and DH 40 was reinforced for increased durability. The optimised cord density means that the tyres can withstand changing loads and the special inner liner prevents gradual loss of air. Uniroyal has been a European tyre brand of Continental AG since 1979. This traditional Belgian brand is considered to be the inventor of the rain tyre and continues to offer quality products for both passenger car and commercial vehicle tyres under the umbrella of the Continental name. Whether for trucks or buses, Uniroyal offers the ideal tyre for any application. Continental develops intelligent technologies for transporting people and their goods. As a reliable partner, the international automotive supplier, tyre manufacturer, and industrial partner provides sustainable, safe, comfortable, individual, and affordable solutions. In 2014, the corporation generated preliminary sales of approximately €34.5 billion with its five divisions, Chassis & Safety, Interior, Powertrain, Tyre, and ContiTech. Continental currently employs more than 200,000 people in 53 countries. The Tyre division currently has 24 production and development locations worldwide. The broad product range and continuous investments in R&D make a major contribution to cost-effective and ecologically efficient mobility. As one of the world’s leading tyre manufacturers, with more than 47,000 employees, the Tyre division achieved sales of €9.8 billion in 2014.